Older release notes are logged here. This Azure Glass release offers you an updated and improved edition of the popular original skin Azure Glass, created by Enfield. JRR Azure Glass features several profiles named "universal" "1x1", "1x2", "2x2", "3x2" and "Basic". 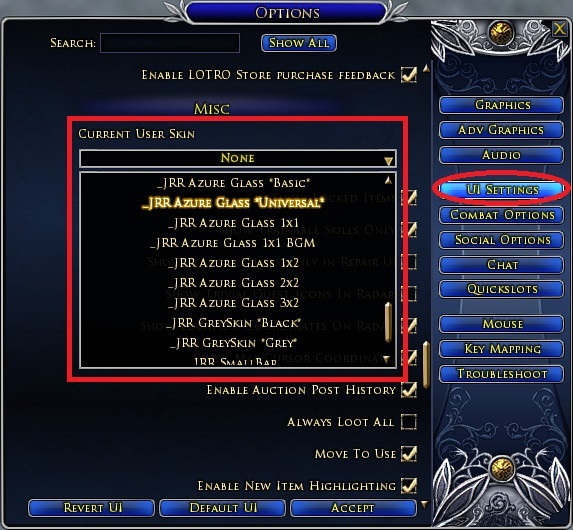 - The skin "_JRR Azure Glass *Universal*" allows you to freely place additional quickslot bars (1 to 5) in the same way than the lotro default skin does. This is the only profile which not requires to manually edit the skindefinition.xml file to center the toolbar depending your display resolution. - The skin "_JRR Azure Glass 1x1 BGM" allows you to freely stack one column of quickslot bars in the same way that most of the skins do. On this toolbar profile, the system buttons are not shown. - The skin "_JRR Azure Glass 1x1" allows you to freely stack one column of quickslot bars in the same way that most of the skins do. - The skin "_JRR Azure Glass *Basic*" allows you to freely stack 2 columns of quicklsot bars side by side. 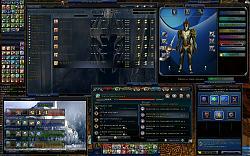 Azure Glass supports mini attunement display, within the main bar, in the same place than champion's fervor. 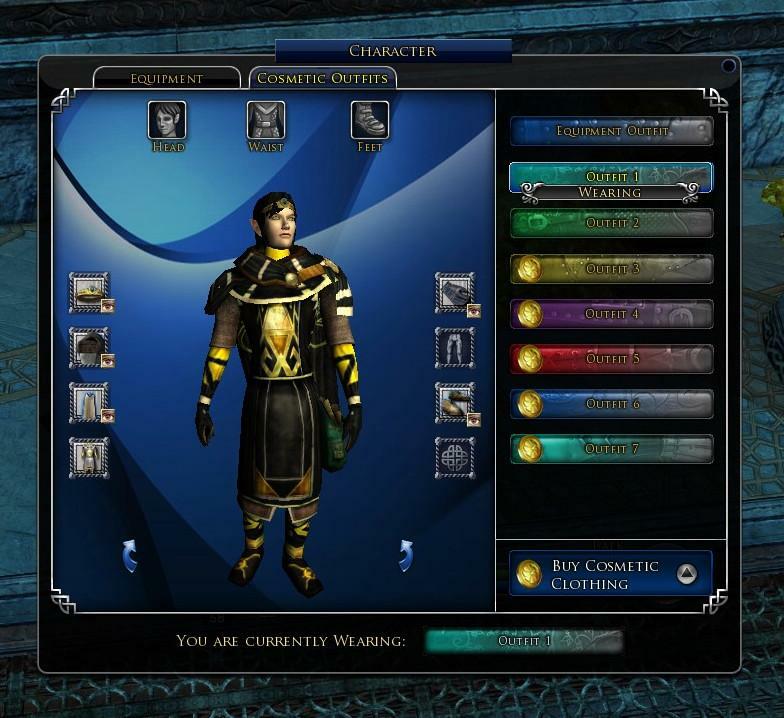 To enable this feature, open LotRO's option panel -> "UI settings" tab -> "Attunement panel size" (a select box a bit under the skin selection select box) -> set it to "small". - Step 1 : Download the file from this page, then unpack it on your desktop. 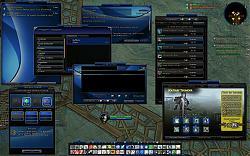 - Step 2 : Do you know which is your LOTRO client's display resolution ? (if you play in full screen, it should be your native screen's resolution). If you play in fullscreen mode, note your corresponding resolution (the first is the width, the second is the height). 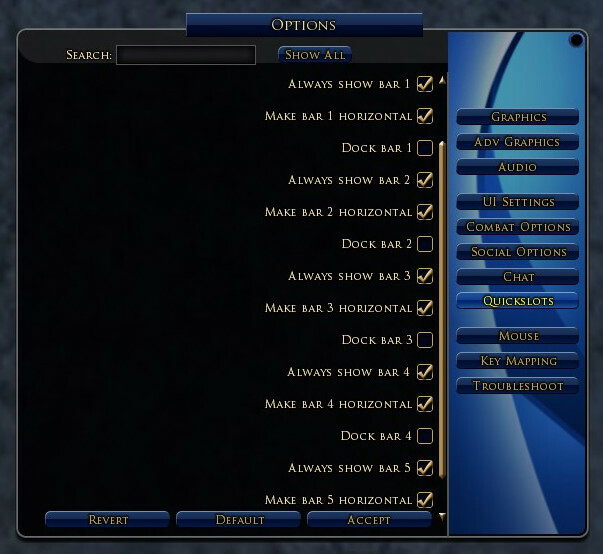 If you play in window mode, note your corresponding resolution, then open the Lotro option panel, select UI settings tab and set the toolbars scale to any value other than 1.00 (0.99 is ok). - Step 3 : Your LOTRO display resolution IS NOT 2560x1440 pixels, so you need to manually edit the skindefinition.xml files present in the folder you unpacked. They are located in the sub folders named _Basic toolbar, _Universal toolbar, 1x1 toolbar, 1x2 toolbar, 2x2 toolbar and 3x2 toolbar. Edit each skindefinition.xml file corresponding to the profile(s) you plan to use. To edit a skindefinition.xml file, open it with Window's Notepad, Notepad++ (it's a freeware) or any else text editor. Don't panic ! You'll just have to modify 2 numbers near the beginning of the text The needed explanations about what to do there are logged in the skindefinition.xml file. Read well, the number isn't the same for all the profiles. - Step 4 : Your skindefinition.xml files are set to fit your personal resolution. 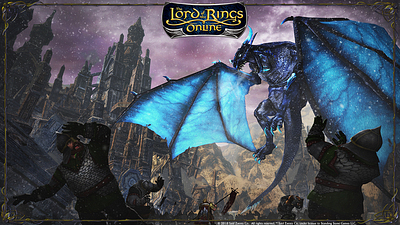 - Copy the "JRR AzureGlass" folder in your "my documents" --> "The Lord of the Rings Online" (this is where your LOTRO sreenshots are located) --> "UI" --> "skins" (plural) folder. Exit LOTRO client if it is running, then (re)launch LOTRO. 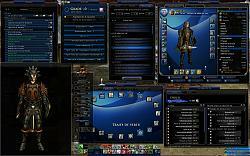 Log on the character onto you want to apply the _JRR Azure**** profile. 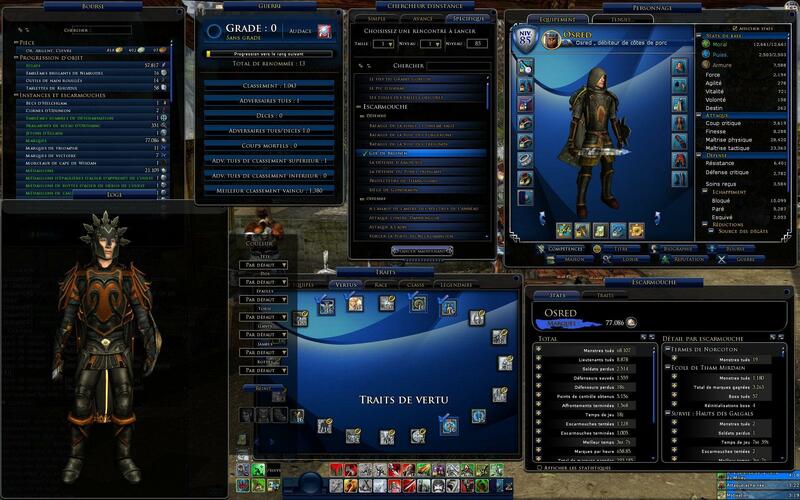 Select the theme from the panel menu --> UI Settings, as shown on the picture below. - Step 5 : Once you have selected the skin/profile you want for your character, you have to logout then login back to get the new custom parameters applied. - Step 6 : Concerning the quickslot bars (12 slots each), the skin parameters can handle only the default one, the other quickslot bars must be positioned by the user. 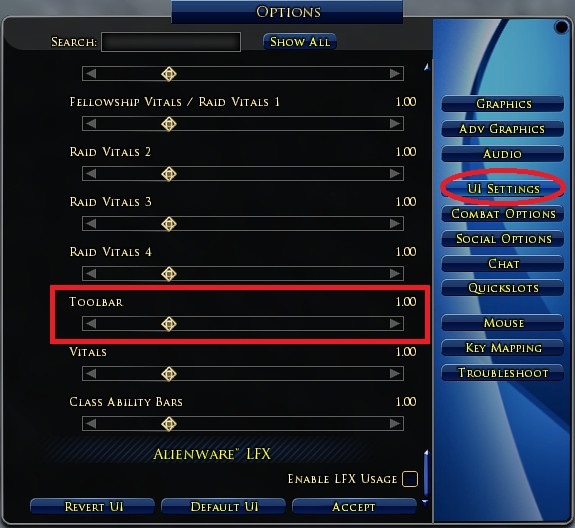 2) Go to "UI Settings"
3) Go to "Quickslot Bars"
9) Lock your UI (" Ctrl + * " or " Ctrl + \ ") and you're ready to go ! When using toolbar profiles 1x2, 2x2 or 3x2 profiles, after character has loaded, the quickslot bar 3 (and only this one) looks greyed, because it has "fallen" to the background of the toolbar ! 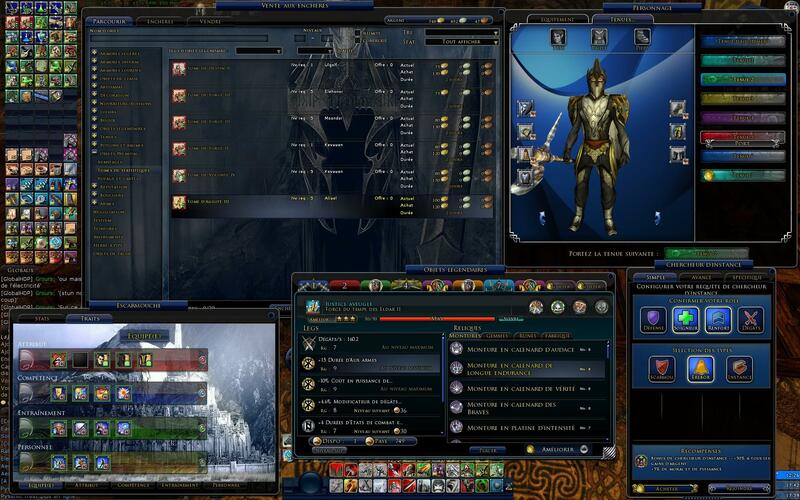 This is a lotro client issue, it is visual only, everything still works ! It occurs wherever the quiclslot 3 is located on the toolbar. 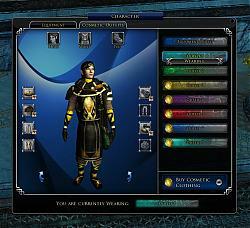 Fortunately, clicking on any slot of this bar brings it back to the front for all the duration of your game session. - If you're using the 1x2 or 2x2 toolbar profile, this issue can be avoid by simply replacing the quicklot bar 3 by quickslots 4 or 5 in your toolbar. - For the 3x2 toolbar profile, you can replace the quickslot bar 3 by another one created with Tonicbars or any other slot bar managing plugin. - I just installed Azure Glass and selected one of the skins on my character, some panels are displayed in a strange manner, like upside down. If only a few elements are greyed, this can be an error from my side (indicating a wrong location of a file in the skin). Don't hesitate to report me this kind of issues. Since Rohan, Turbine bugged the toolbar code, then you now have to edit the "Y" value of the toolbar code in addidition of its "X" value. All needed explanations about what to do are logged into the skindefinition.xml files. These files are located in the Azure Glass skins profiles folders. You can open and edit them with Window's Wordap or any else texte editor software. 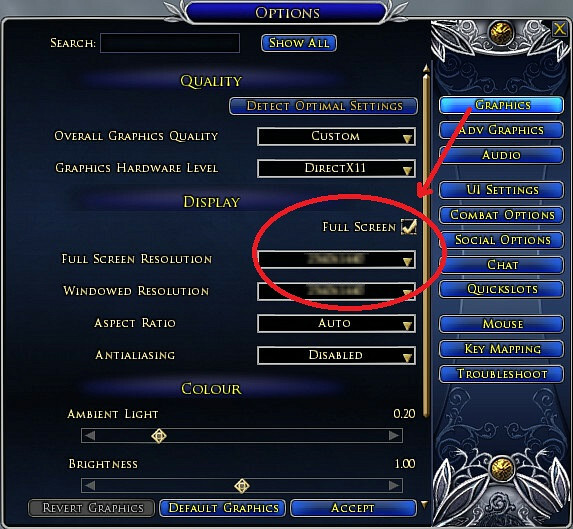 I you play in window mode or switch between window mode and fulscreen mode, you can bypass the "Y" issue by simply setting the toolbar scale to a value different than 1.00 ( in lotro option panel -> UI settings tab) (0.99 or 1.01 is ok). - Many panels elements are from Brygard's B.G.M, some other pictures and codes come from Eclipse UI. - Dressing room by Brygard, modified by Jack and by Adra. - "Ultra Mini-packs!" by rushl. - Virtues Re-organized by Adra. You can receive an email notification on JRR Azure Glass updates. Last edited by Adra : 01-03-2012 at 10:59 AM. Love this skin. Was using the Mirkwood version up until today, but you've done some very cool things with it since then. Would you be able to modify the Deed Panel tabs similar to how the Mirkwood version has it? 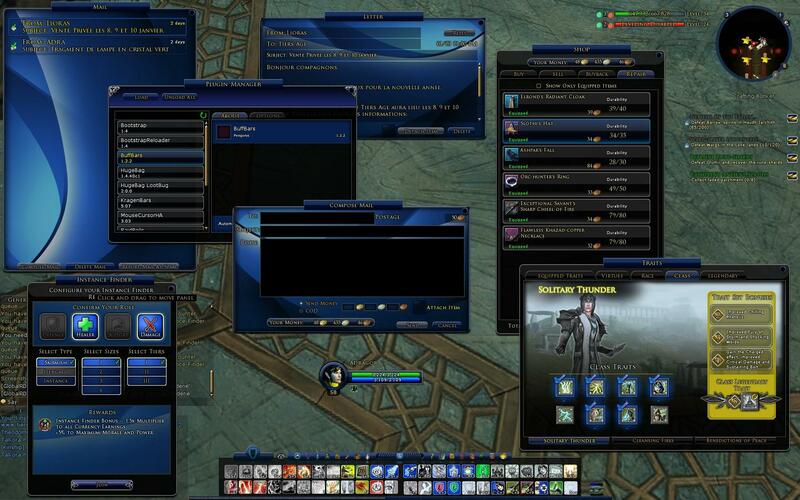 They're (almost) all blue, more square shaped type tabs as opposed to the pointy things that come default. Of course it was bugging me since tabs have been added since Mirkwood and all of those showed as the original ones did, so it was kind of a mish-mash. I'll check to reimplement the background but keeping the default mini tabs. Edit : Custom deed log will be back on next update ! Last edited by Adra : 01-27-2012 at 11:37 AM. JRR and Azure Glass v2.1 released ! Last edited by Adra : 09-12-2012 at 04:46 AM. Azure Glass v2.1.1 released ! 1x1 toolbar is now a short bar ! Last edited by Adra : 09-12-2012 at 04:47 AM. I've got the problem, that the wardrobe doesn't work? It's only a black box and my character isn't shown. May you have an idea for solving that problem? Edit: I have that prob with all JRR-Themes. So I'll write down again in the JRR-comments. Last edited by Irmi : 02-07-2012 at 01:19 PM. The bug with the wardrobe should occur only on very low screen resolutions, when heigh is below 768 pixels. JRR is designed to run on a minimal resolution of 1024x768. Last edited by Adra : 03-12-2012 at 05:59 AM. Thanks to you for this comment, it's actually appreciated ! Last edited by Adra : 04-07-2012 at 08:21 PM. Azure Glass v2.4 released ! - Added a new toolbar profile, the "JRR Azure Glass *Basic*". I completely rebuilt this toolbar from an outdated edition of azure glass, by Corita. 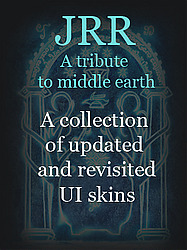 - Same other enhancements than in JRR v2.4. - Requires JRR v2.4 installed.